Could you help raise much needed funds for CASA? Support people with disabilities by taking part in this walk of reflection on Sunday the 27th November 2016. 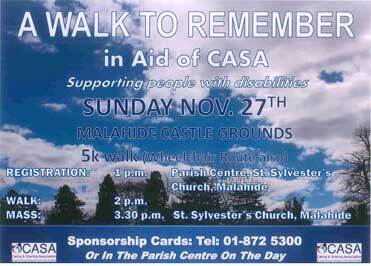 Walk with us in the grounds of the beautiful Malahide Castle. The route is approximately 5 km in total and there is a wheelchair accessible route also. Registration is at 1pm in St Sylvester’s Parish centre.